Mention Memphis, Tenn., and the mind trips down Beale Street. The ears hear blues, the mouth starts watering for BBQ and eyes can almost see “the King in the Jungle Room” at Graceland. A stone’s throw from this city on the mighty Mississippi River is Southaven, Miss., with a reputa- tion built on another purely American classic—baseball! It’s one thing to build parks. It’s another to maintain them year after year. The elements seem simple—facilities, equipment and staffing. The execution, as one may well expect, is not always so simple. Keeping the facilities competi- tive takes the commitment of the mayor, the board, and, of course, the parks and recreation staff. Southaven’s team has hit one out of the park with Snowden Grove! The impetus to develop Snowden Grove Park started with the donation of 150 acres of land worth between $4 mil- lion and $5 million on the east side of town. The west side had soccer and football fields, the center of town the girls’ softball fields. The decision seemed obvious. Create something the city did not have. Snowden Grove Park would be the baseball facility. Many of the features found at Snowden Grove previously were found only at professional stadiums. Each of the 17 fields features grass infields and out- fields with sub-surface drainage and com- puterized irrigation systems, lighting that substantially exceeds the minimum youth field requirements, electronic scoreboards and covered and enclosed dugouts. Hosting players from the ages of eight years old and up, the fields reflect the ath- letic prowess of each age group. Fence dis- tances range from 180 feet to 395 feet in the following distribution: five fields at 180 feet; two fields at 200 feet; four fields at 250 feet; four fields at 275 feet on the foul line, with a 300-foot setback at center field; and two fields with 325 feet on the foul line and 395 feet at center. Added to the field amenities are a main concession area with two 50-foot by 100-foot-long pavilions with picnic tables, portable concession kiosks throughout the park, a VIP area on the second level of the main concession, an on-site gift shop, side walks throughout the complex, profes- sional landscaping and ample paved park- ing. Players, parents, siblings and coaches are well cared for at Snowden Grove. Snowden Grove Park has hosted and continues to host many of the major tournaments held in the amateur base- ball and softball world. 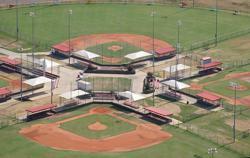 The United States Specialized Sports Association (USSSA) World Series has held events at Snowden yearly since it opened. The National Amateur Baseball Federation World Classics just signed another three- year contract. The Dizzy Dean Baseball World Series in the eight, nine, 13, sophomore, junior and senior divisions will play at Snowden through 2009. Critical to the success of any base- ball park is the quality of umpiring officials—the folks most players and coaches love to hate. If you have ever played baseball or softball, do your experiences match these? “The strike is consistent for both teams.” Umpires are “skilled professionals.” “Even questionable calls left you smiling after talking to the umpire.” Scotty Baker, program manager, keeps a tight rein on the umpiring staff. “Umpiring chiefs have developed an excellent system of screening potential umpires,” he says. “Each candidate is a high school-certified state umpire and receives additional training by Snowden staff. We have an ongoing review process, and when we have problems they are quickly addressed,” says Baker. The park staff benefited with the selection of Shade Systems products as well. In addition to the quality and warranties, they also have a patented Turn-N-Slide easy-fastening system to allow for quick removal and re-attachment by park staff, eliminating the cost of expen- sive outside installers each season. WiFi is now available at the fields, allowing parents either to work or to update family and friends on athlete and team performance instantly. Next on the to-do list is the retrofit of one of the fields into a 2,500- to 3,000-seat stadi- um to house high school and collegiate baseball games. Linda Stalvey is a freelance writer and regular contributor to Parks & Rec Business who gave up Washington, D.C., public relations to indulge her passion for parks, environment and outdoor activities in Medina, Ohio. You can reach her via e-mail at lstalvey1@verizon.net.